At the forefront of innovation and entrepreneurship, Foisie Business School faculty brings research into the classroom, giving students an opportunity to learn by doing. From applications that help people manage diabetes and reduce stress, to eye- tracking technology that improves user experiences, to how businesses can learn from the arts, to projects that help make businesses more sustainable, our faculty research makes a real-world impact while inspiring a new generation of makers, leaders, and boundary breakers. 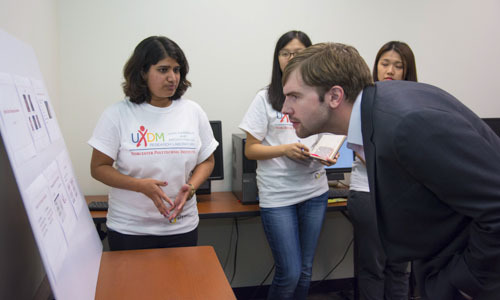 The UXDM Lab creates value through innovation with user experience. In collaboration with academic researchers and industry experts, the lab investigates the entire user experience through observation, physiological measuring and eye-tracking. WPI Foisie Business School faculty talk about the supportive and collaborative culture that provides opportunities for their research—and how sharing their passions enhances the academic journey for their students. As part of their overall research interest in how technology can improve the delivery of healthcare, Diane Strong and Bengisu Tulu, faculty researchers in the Foisie Business School, apply funding from the National Science Foundation and the National Institutes of Health to create apps that give patients more control over their own well-being, reduce the need for doctor visits and other interventions, and to improve the quality of care that physicians and other healthcare providers can deliver.